Most of the names on Wyoming U.S. Sen. John Barrasso’s impressive list of campaign contributors are either Fortune 500 companies or familiar Washington special interest groups. But one, at the very top, sticks out. 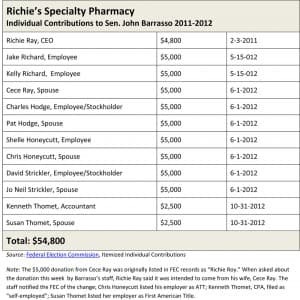 Richie’s Specialty Pharmacy — its owner, employees and spouses in Conroe, Texas, a northern suburb of Houston — gave more than anyone else: $54,800 in all, to the junior senator from Wyoming, according Federal Election Commission records for 2012 collated by the Washington Center for Responsive Politics. Taken alone, the contributions flowing from an obscure Texas business are a revealing case study of influence-shopping in the nation’s capital. From a broader perspective, however, they illustrate the remarkable ability of a Wyoming politician not named Cheney to open the checkbooks of conservative Texas donors, notably in the health and energy sectors. Among individuals who donated the maximum amount allowable – $5,000 – to the successful 2012 Barrasso senate campaign, 62 came from Texas and 25 came from his home state of Wyoming. If, as many believe, Barrasso has aspirations beyond the senate, this skill at tapping into Texas’ deep conservative financial reserves could serve him well in the future. According to his most recent filing with the Federal Election Commission on December 12, 2012, Barrasso had $2,643,688 left in his campaign fund after the November election. He does not face reelection until 2018. Although its name may sound like a corner drug store, Richie’s Pharmacy is actually a fairly big deal in Texas; its website claims the company serves 11,000 doctors and 80,000 patients. This makes it one of the larger in the expanding group of a special class of “compounding pharmacies” that critics such as the New England Journal of Medicine claim have become big-time, largely-unregulated drug manufacturers. “Richie’s is a compounding industry leader providing a wide variety of different compounded medications, counseling patients in over 170 languages, accepting over 3,800 insurance plans and offering 24-hour availability to pharmacists for patients who have questions,” the company reported in an August, 2012, press release. In 2007, the last year recorded by the Dun & Bradstreet service, Richie’s reported sales of $13,571,958 with 40 employees. These businesses – which have transformed the traditional small pharmacy practice of hand-mixing drugs for individual patients into mass-production assembly lines – jumped into the headlines this fall in the wake of the deadly 2012 New England Compounding Center catastrophe. The Framingham, Massachusetts, company produced and distributed tainted drugs to 75 medical facilities in 23 states, causing a deadly outbreak of fungal meningitis. So far, outbreak has led to 678 infections among 14,000 patients and at least 44 deaths in eight states, although none so far in Wyoming. Tennessee and Michigan have the highest death tolls with 14 and 12 respectively. Wyoming’s senior senator Mike Enzi, ranking Republican on the Senate Health, Education, Labor & Pensions Committee has called publicly for more supervision of the compounding industry. “This case represents a catastrophic failure by the regulatory agencies that are charged with protecting patients from unsafe drugs. Such a failure is unacceptable,” said Enzi, normally a staunch opponent of increased federal regulation. Unlike the troubled New England Compounding Center, Richie’s Specialty Pharmacy is certified by the industry’s self-regulating Pharmacy Compounding Accreditation Board (PCAB). Richie’s Pharmacy president, Richie Ray, is a public proponent of high industry standards but not increased federal regulation. Ray is also chairman of the political fundraising committee for the national International Academy of Compounding Pharmacies (IACP) and a director of the Texas Pharmacy Association’s PharmPac. But in the wake of the meningitis tragedy, all compounding pharmacies — good and bad — have been caught up in the recent push by federal Food and Drug Administration commissioner Margaret A. Hamburg, Massachusetts U.S. Rep. Edward J. Markey, and others for tighter federal controls. Sen. Barrasso’s relationship with Richie’s Pharmacy predates the furor over the meningitis outbreak. It developed at a time when the compounding pharmacy industry was shopping for a champion on Capitol Hill to guard against what it saw as the constant threat of federal incursions into the industry. The battle over federal regulation of large-scale pharmacy compounders has been long and bitter, fought in the courts and in Congress as well as in state legislatures across the land. For a time, at least, some in the compounding industry may have felt they found an ideal defender in John Barrasso, one of only three physicians in the U.S. Senate and a regular guest on Fox News, MSNBC, CNN and other national television outlets. According to his Senate website, Barrasso made 65 appearances on Fox news programs in 2012. 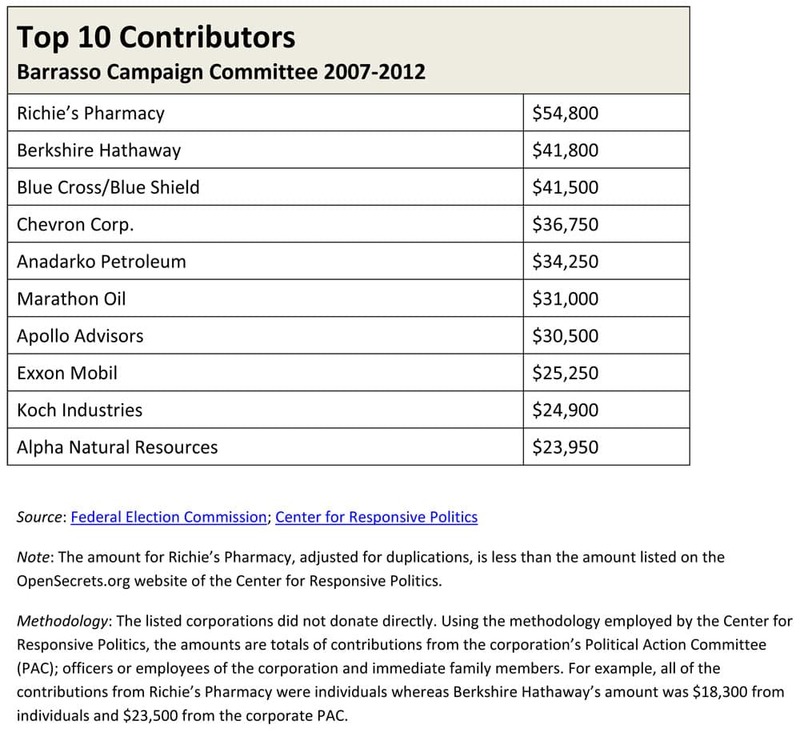 According to federal election records, Richie’s Pharmacy president Richie Ray made an initial $4,800 contribution to the Friends of John Barrasso campaign fund on February 3, 2011. 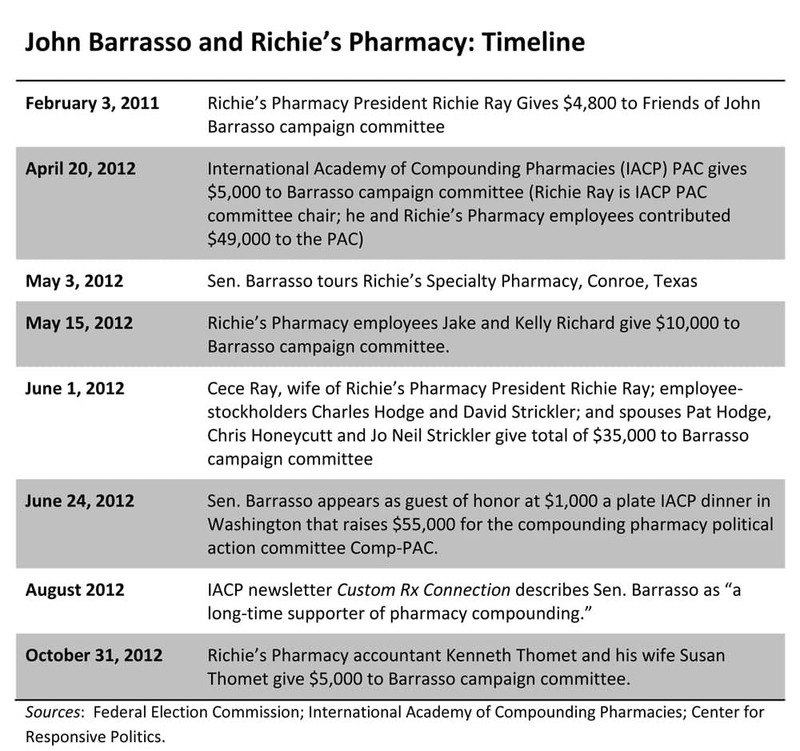 In April, 2012, the International Academy of Compounding Pharmacies PAC, bolstered by $49,000 in contributions to the PAC from Richie’s employees and their spouses, chipped in $5,000 for the Barrasso campaign. On May 3, 2012, Sen. Barrasso flew to Houston and personally toured Richie’s Specialty Pharmacy. It was a visit widely appreciated in the compounding community. 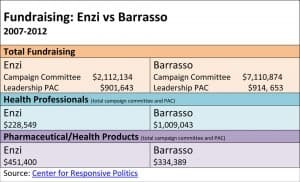 Barrasso’s Conroe visit was followed by two more rounds of contributions from the Richie’s group on May 15 and June 1, 2012, all for the maximum amount allowable for individual donors. 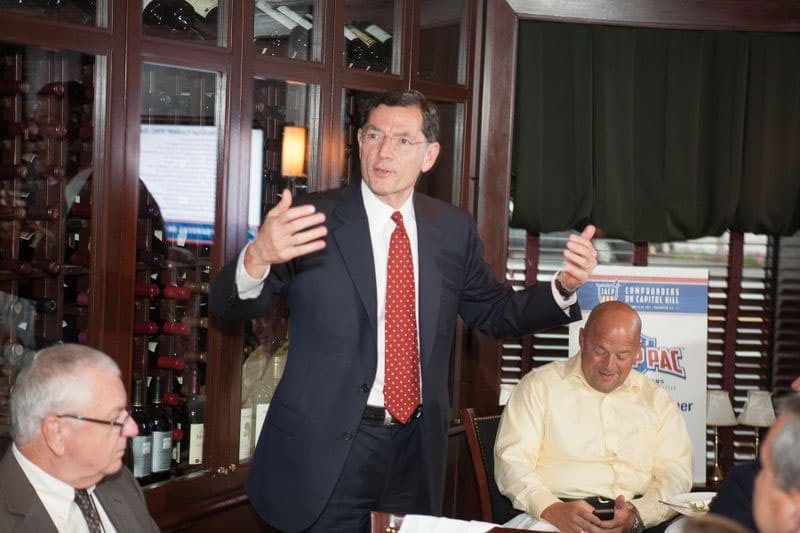 On June 24, Barrasso appeared as the guest of honor at a $1,000 a plate Washington, D.C., dinner that raised $55,000 for the compounders’ association political action fund Comp-PAC. By August, the Richie’s group had contributed a total of $49,800 to the Barrasso campaign (one final contribution of $5,000 would come later from Richie’s accountant Kenneth Thomet and his wife, Susan Thomet) . What Barrasso actually thinks about compounding is unclear. 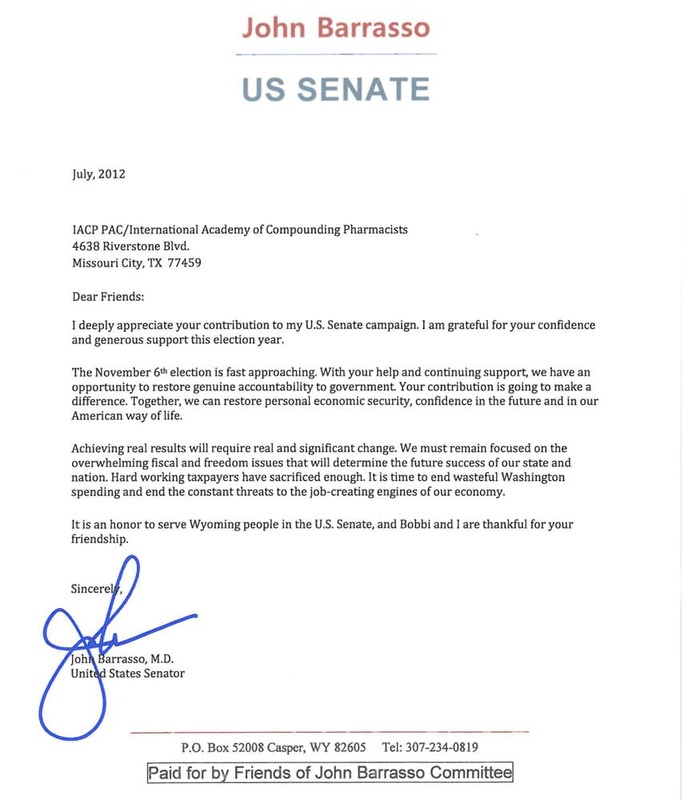 Although his staff was helpful with some of the details of this story, the senator did not respond to WyoFile questions asking him if he agreed with the statement that he is “a long-time supporter of pharmacy compounding” or, in the wake of the New England Compounding disaster, if he feels stricter federal regulation is in order. What Richie Ray and the other donors expected to achieve with their contributions is equally unclear. As chairman of the GOP Senate policy committee, Barrasso ranks fourth in the senate party hierarchy, well above Sen. Enzi. Unlike Enzi, however, he does not sit on the important senate Health committee that oversees the Food and Drug Administration. According to the IACP’s Dodge, it is simply a matter of showing the compounding industry’s goodwill to someone who is senior in the Republican leadership. 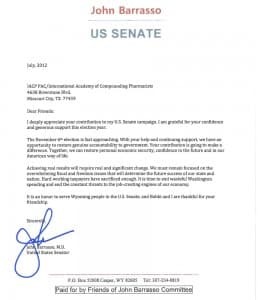 Despite receiving several voice-mail messages and detailed email messages from WyoFile, Richie Ray did not respond to questions about why he and his Texas group invested so heavily in the campaign of a senator from Wyoming, where there are no major compounding enterprises. David Strickler, a Richie’s employee-stockholder who along with his wife Jo Nell Strickler contributed $10,000 to the Barrasso campaign, spoke briefly with WyoFile from his home in Magnolia, Texas. “I’d rather not speak on any sort of formalized response,” said Strickler. “We contribute heavily to conservative candidates both in the Senate and the House.” Federal records show that Richie’s employees and spouses contributed to other candidates, including Texas Republican Sen. John Cornyn, who as minority whip sits just above Barrasso on the GOP leadership chart. 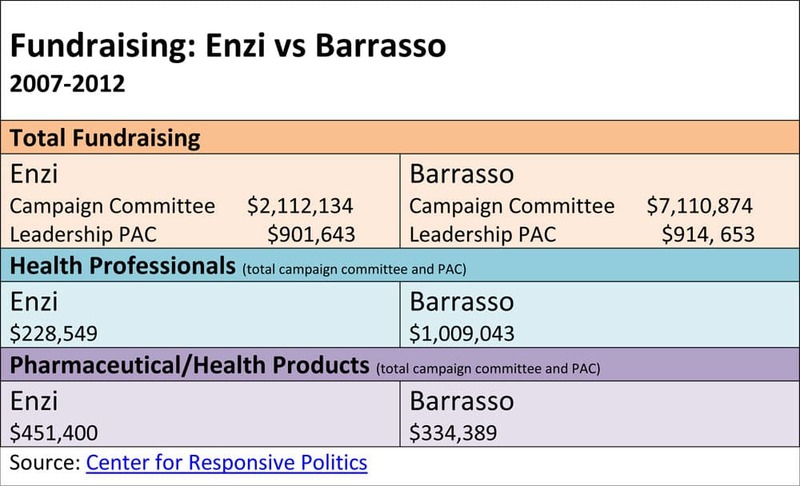 But Barrasso is by far the biggest recipient. This means, for example, that an employer cannot give an employee the money to make a contribution to a candidate. And, likewise, a candidate cannot knowingly accept contributions from one of these reimbursed donors, commonly known as “straw donors.” A violation of these rules by either party can result in a civil penalty of up to $50,000 for each incident. The Federal Election Commissions (FEC) enforcement division has prosecuted hundreds of such cases. In 2012 it fined the Obama for America campaign committee $183,865 for violations of a different section of the same statute during the 2008 presidential campaign. Large corporations normally give money to candidates through their political action committees (or PACs) and from a handful of their highly-paid top executives, whose political activities are built into their salaries. Also, lobbyists who represent these companies often make contributions if they think it is in their client’s best interest. Cases like Richie’s, in which all of the contributions are from individuals related to the company by work or marriage, are more unusual. The cluster of contributions functions much like a corporate PAC. But for the contributions to be legal they must be made by individuals with their own money. Individual contributions have a cumulative advantage over PAC contributions, which are limited to $10,000 per candidate per election cycle. So a group of company employees who independently decide to give their own money to a candidate can give a much larger total than a corporate PAC. However, the FEC carefully scrutinizes such individual contributions, particularly when they are given for the maximum amount allowable on the same date or dates. 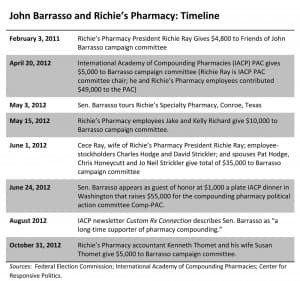 Although Richie’s is a prominent example, Barrasso has had remarkable success raising money in Texas, where campaign expenditure records show he made several trips in 2012, including the May 3 visit to Richie’s Pharmacy. In the 2011-2012 election cycle he raised nearly as much for his “Friends of John Barrasso” campaign fund from individuals in the Lone Star State ($306,800), as he did in Wyoming ($354,238). The amount is even more impressive when you compare it to the contributions of Wyoming’s other U.S. Senator. Federal election records show that since 2004 Texas individual contributors have given Sen. Enzi only $7,250. 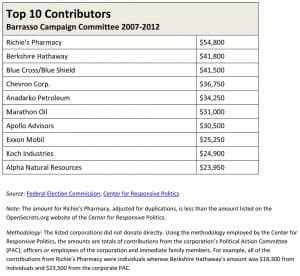 Some of the Barrasso money came from senior corporate executives like Marathon Oil Executive Vice-President David Roberts, who gave $5,000. But a great deal came from medical doctors affiliated with practices or hospitals in East Texas, Houston and the Rio Grande Valley. In all, 94 Texas physicians gave money, usually for the maximum permissible, to the 2012 Barrasso campaign. A group of doctors and their spouses in Tyler, Texas, for example, gave Barrasso more than $25,000. Similarly, a cluster of physicians in Houston contributed more than $22,000. One of biggest sources of money was in Texas’ Rio Grande Valley, where 28 doctors contributed almost $25,000 in individual contributions and another $5,000 through their Border Health PAC. One of the contributors was the prominent anesthesiologist and conservative talk radio host Dr. Lawrence Gelman of McAllen, Texas. Dr. Gelman, who gave $2,000 to Barrasso, is on the board of the physician-owned Doctors Hospital at Renaissance in Edinburg, Texas. In a telephone interview with WyoFile, he said this made him feel comfortable with Barrasso, who was co-owner of a private orthopedic practice in Casper. Author of several books, including one entitled “The Hoax of Global Warming,” Gelman is co-host with Rabbi Steven Rosenberg of the conservative “Dr. Lawrence Gelman Show” on the Talkback Radio Network. A major donor to conservative candidates and causes, including several thousand dollars to the Swift Boat Veterans for Truth campaign against Sen. John Kerry in the 2004 presidential campaign, Gelman also feels an ideological affinity with the Wyoming senator. — Rone Tempest is a former national and foreign correspondent for the Los Angeles Times. From 2008-2010 he was WyoFile’s editor. He lives in Lander. Slimiest snake in the swamp. It must be obvious to even the most naive Wyomingite that Barrasso is acting like a student who insists on answering the teacher’s question by raising his hand, leaning in his seat toward the front of the classroom and pleading: “Oh, teacher, me, me , me”. Of course he wants the top spot in government. Isn’t that what so many in Congress are trying to achieve? Ever noticed how he’s almost always dressed in red, white and blue and standing in front of at least three American flags? Ever notice how he has squirmed into spots right next to nationally-televised GOP hatchet-men like Mitch McConnell and the like? Why? It is unfortunate that a doctor whose medical advice column in the newspaper amounted to little more than “button up or risk getting a cold” can take the side of big business and big healthcare and how his actions are to the detriment of the people who, by the mandate of the Hippocratic Oath––he is obligated not to harm. Typical Politician, so my question, who does Mr. Barrasso work for? 60% Texas, 40% Wyoming? Or is it 100% corporate? IMO he is a Mitch McConnell puppet, working for the wealthy. In another point, his party is touting “Energy Independence” while pushing to ship Natural Gas over seas and promoting the Canadian “Oil Sands” pipeline to produce the nastiest crap on the planet, he voted against the “Violence Against Women Act”, What??? I am a Wyoming Native, unlike Mr. Barrasso and care deeply about this state, it appears we are just a stepping stone in his career. Wyoming needs to quit voting straight “Party-line” and elect the most suitable candidate, i.e. Cindy Hill??? Now re-read the quote: “We have a physician-owned facility here so there is a lot of mutual understanding, not just being a physician but also ownership of medical facilities,” said Gelman, who said he had met with Barrasso on at least two occasions in Texas and Washington. Makes it doubly clear what that “donation” might be targeting… A follow-up interview from WyoFile with Barasso would be welcome! Will he dare? I was happy to read your comment, “…as many believe, Barrasso has aspirations beyond the senate”. Several years ago while he was still in Wyoming I was able to set down with the Senator in a casual conversation. We visited andhe answered a few questions, made a few comments that fit my questions. After the conversation I felt like I had just bought a little snake oil and as I have watchedhim since I really feel I was right. The Senator is promoting one thing and that is the Senator. Wyoming, Texas or compounding pharmacies will be used as long as he gets his name recognition out there and it builds his political clout. Do you suppose Barrasso is striving for the ultimate top spot? He has about as much chance of that as snowball in Hell. And especially with his stand against climate change along with all the other good red-necked Republicans. Thanks, Rone, for your good expose. I think I already know the answer to this, but was Barrasso asked to comment or explain himself during the reporting of this story ? if so , did he decline the opportunity to do this for Wyoming’s best reporter at Wyoming’s best investigative news outlet ?? I would like to know what defines “good listening” in an elected official? 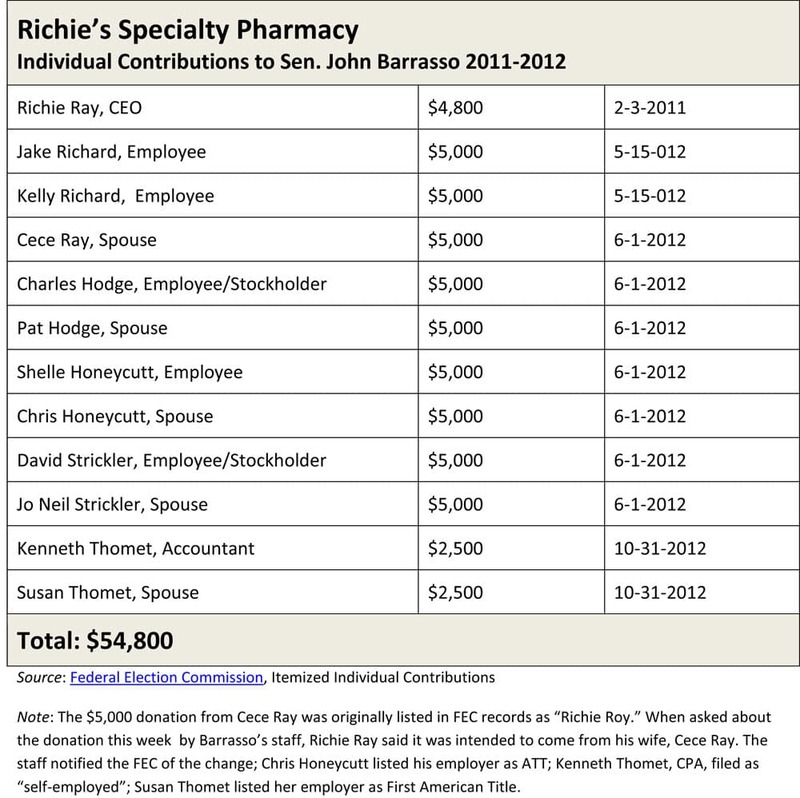 Barrasso gets this money from the aptly named Richie’s because the senator is a “good listener” to the compounding pharmacy interest group. This helps us… how? The obvious answer is he represents out-of-state interests with minimal connections to Wyoming citizenry and daily life. Why, oh why, is it so hard for the average citizen to see and understand that brutal reality? Part of the reason, is that aside from Wyofile’s periodic efforts, no one else in the media strives to provide regular reportage about our congress critters, their votes, and who’s buying influence with them (then showing the evidence that that influence helped purchase specific votes). Oh for the days when the Casper Star Tribune maintained a reporter in Washington, D.C.